Anybody who has taken a simple painless commercial ancestral Y-DNA test (which only explores your paternal ancestry) will potentially have matched many people with lots of different surnames, and will have wondered when their shared male ancestor with all these genetic relatives once lived? 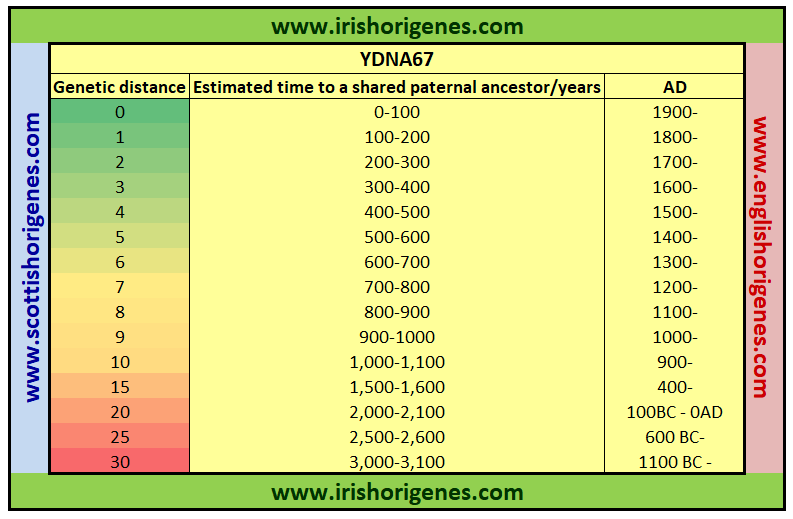 To aid in determining when one’s common male ancestor lived I have constructed a table that details the estimated time to a shared male ancestor based on the number of shared markers at the 67 marker level (see attached table). The table is based on the results of a ‘closet-MacGregor;’ someone with the surname ‘Valentine’ but whose Y-DNA results revealed that his ancestor was originally called MacGregor. Mr Valentine’s ancestors can be traced back to Montrose in Northeast Scotland in the early 1700’s where Scottish Valentines originate, which is supported by his DNA results which show that his closest matches are indeed to other Valentines (see red arrows attached image). 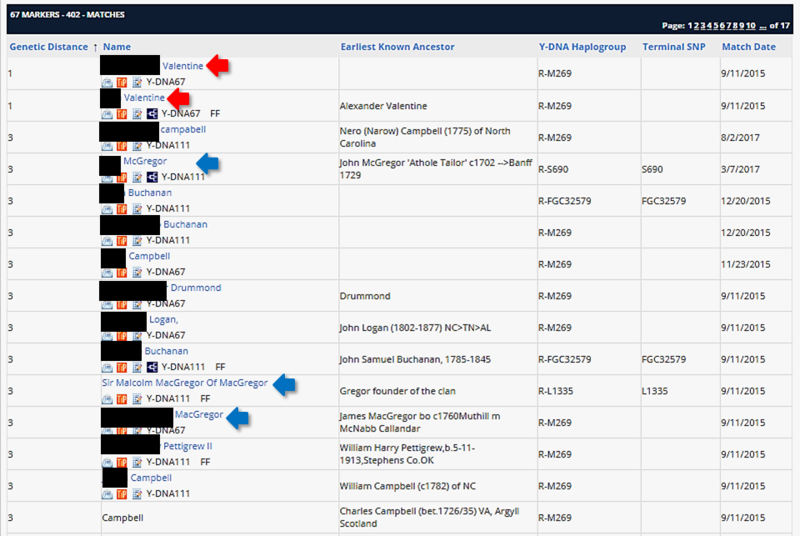 However, Mr Valentine's DNA also reveals that he is a more distant genetic match to large numbers of MacGregors (blue arrows attached image) including the current McGregor Chief (hence his ancestor was related to the Chiefly line of the MacGregors). Given his detailed family history, his ancestor had to have changed his surname to Valentine soon after the MacGregors were outlawed in 1604AD and hence using that time point and the genetic distance between him and the current Chief of the MacGregors one can estimate a time to a shared paternal ancestor based on the numbers of shared markers at the 67 marker level! Click here to read the full Valentine Case Study. What will your DNA reveal? Click here to contact Scottish Origenes for a FREE CONSULTATION on your DNA results or to find out what DNA test is suitable for you!